Dread heading to the great outdoors - or even your back deck in the evenings - for fear of being eaten alive by the wee beasties? Don’t relish the thought of slathering yourself with sticky, smelly, toxic insect repellent? Try going au natural – it’s safer. Most major insect repellent brands contain DEET – a controversial bug repellent classified as ‘slightly toxic’. Application of DEET can cause important skin and eye problems, including rashes, conjunctivitis, contact dermatitis, and has been linked to neurological problems, according to the Sierra Club of Canada. Citing health risks, Health Canada banned insect repellents with more than 30% active DEET in April 2002. 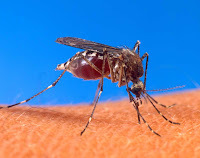 If you do use a DEET-based repellent, the Sierra Club suggests not applying it indoors and that it not used by pregnant women, children under two years or people taking antihistamines. As a safe alternative try a natural insect repellent with non-toxic, essential oils such as citronella, lemongrass and eucalyptus with strong bug discouraging properties and bug repellent scents. Natural repellents are non-greasy, generally non-aerosol and have a pleasant odour – to us. Wear long-sleeves and pants when outdoors, especially from dusk until dawn. Loose clothing made of thicker materials are more difficult for mosquitoes to bite through. Replace outdoor incandescent lights with yellow ‘bug lights’ which attract fewer mosquitoes. At Lavish & Lime, our natural insect repellent Bug Joose! is completely DEET-free. Made in Canada of pure essential oils, including citronella and lemon grass, it comes in a non-pressurized pump bottle - it's safe for you and for the environment too.